Unfortunately, any photograph of Robert Morris’s Untitled (L-Beams) is going to miss the point if we want to understand the object both in an artistic and material sense. Morris wanted to expose the conditions of perception and display and the fact that these conditions always affect the way we comprehend the art object—sculpture always exists somewhere in relationship to someone at sometime. This specificity, Morris felt, had not been investigated enough, even by the many avant-garde experiments that define Modernism. A function of space, light, and the viewer’s field of vision […] for it is the viewer who changes the shape constantly by his change in position relative to the work. […] There are two distinct terms: the known constant and the experienced variable. Informed by theories of the body and perception, including his reading of Maurice Merleau-Ponty’s Phenomenology of Perception (1945), Morris explored the circumstances of the art object as we actually encounter it. He asked, why do we ignore the space and conditions of display in the presentation of art? Why do we only focus on the object? What about everything that circumscribes it; from its frame, to the wall that it is hung on, to the shape of the space that we put it in. Like other artists of his generation, Morris pursued an advanced education in art history and earned a Master of Arts degree from Columbia University. Furthermore, Morris was associated with the Judson Dance School, an experimental group of performers who sought to push the conceptual boundaries of dance. These experiences informed Morris’s understanding of what art could be, both in relation to the gallery and to history. In relation to his artistic exploration of perception and space, Morris was explicitly influenced by Hans Namuth’s photographs of Jackson Pollock and also by Allan Kaprow’s reading of Pollock. Kaprow’s essay, “The Legacy of Jackson Pollock” (1958), urged a new generation of artists to adopt the use of “sight, sound, movement [and] people” in order to make their art. Kaprow supported this call with his own brand of theatrical “Happenings,” in which he staged bizarre and unplanned events in art galleries, further informing many young artists. Morris has explained the theories behind his art practice in his teaching and in writing where he has sought to justify his art to a larger audience and enter into the debate surrounding his own practice. In particular, the summer edition of Artforum (1967) included not only Morris’s “Notes on Sculpture 3,” but also Robert Smithson’s “Towards the Development of an Air Terminal Site,” Michael Fried’s “Art and Objecthood,” and Sol LeWitt’s “Paragraphs on Conceptual Art.” This issue is of utmost importance in understanding Morris’s relationship to Modernism, Minimalism, and to Conceptual Art. 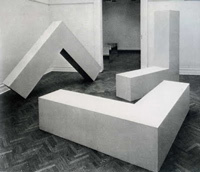 Morris’s Untitled (L-Beams) were shown in the exhibition, “Primary Structures: Younger American and British Sculpture” (April 27 – June 12, 1966). This exhibition, which took place at the Jewish Museum in New York, effectively launched Minimalism into the discourse of contemporary art on the international stage. The critical and art historical discussions that followed this exhibition resulted in important debates over the inherent significance of the Minimalist object, the role of the artist in its production, and the role of the viewer in relation to the creation of its meaning. Cite this page as: JP McMahon, "Robert Morris, (Untitled) L-Beams," in Smarthistory, August 9, 2015, accessed April 20, 2019, https://smarthistory.org/robert-morris-untitled-l-beams/.